Dave Wyman was a fixture at linebacker for the Stanford Cardinals. A tackling machine, who was named the team’s most valuable player in 1983, he blew out his knee so badly in 1984 that the upper part of his leg was pointing one direction and the lower another. He spent the entire year out of football rehabilitating the knee and getting back up to playing speed. It paid off as Dave led the team in 1986 with 169 tackles. 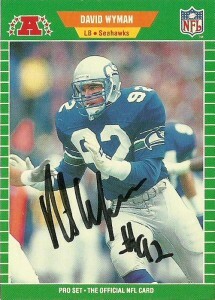 The Seahawks made Dave their second round choice of the 1987 draft. He again established himself as a fixture at linebacker for the Seahawks by 1988, occupying first the RILB position and them moving to MLB. Over a 6 year career at Seattle, Dave had 3 100+ tackle seasons, before moving in 1993 to Denver where he finished his career after the 1995 season. 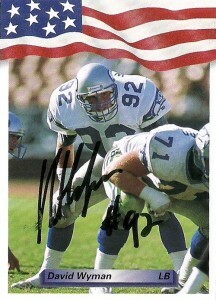 Wyman is torn by the current NFL attempt to cut down on players leading with their helmet where he was quoted as stating that, “My head was my weapon of choice”. When the Stars & Stripes set came out, I flat out avoided it. I just didn’t get the idea of merging patriotism with football and really it came off as sort of trashy and generic to me. They were also a bit expensive too. When I received the S&S cards as part of the Canton Acquisition, I almost wanted to reject them, because I have no interest in them still. The Pro Set cards of course were above and beyond what were in the market at the time and here we have another excellent action shot that gave a regional player some exposure to a larger fan base, galvanizing you to read more about him on the back of his card.